MUMBAI: The plastic industry has committed itself to do everything it can to minimize the impact of plastics on the environment.It put a strong emphasis on the recycling capability and creating higher percentage of recycled products. The industry also claimed that it was working towards finding effective solutions. These were the highlights of the five-day Plastivision India 2013, a B2B gathering of plastic industry and its other stake holders.In the event, a green pavilion was created for people to understand how plastics can be environment friendly. Several innovations too were put on display in the event. 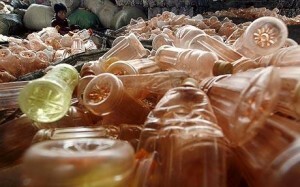 One of the most prominent was the options available in biodegradable plastics and its various utilities. Several biodegradable master batches were also demonstrated as additives that can make plastics biodegradable.The five-day trade fair tried to send the message that recycling plastics was extremely relevant in the Indian context. “India needs to catch up upon its percentage of recycled plastics in its total consumption. Though we have substantial recycling capacity, the hurdle is absence of sufficient infrastructure to collect plastic waste. For this, a better civic discipline is the first step that needs to be initiated. The government, the civic bodies and the plastic industry needs to work closely on this. People should stop littering plastic waste. Once this is achieved, every other solution will fall in its place almost automatically,” said Raju Desai, chairman, Plastivision-2013.